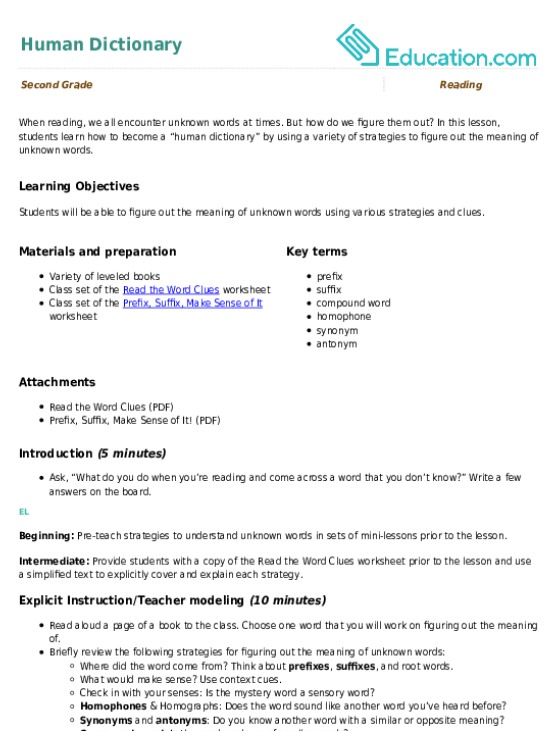 This lesson can be used as a pre-lesson for the Be a Nonfiction Detective! lesson plan. determine: To decide something or make a decision. product: Something made by humans or machines. community: An area where a group of people live. organization: People who work together to get something done. center: A place that hosts activities. main idea: The most important information that the author is telling the reader. Students will be able to use various strategies to understand nonfiction text. Students will be able to figure out unknown words with sentence level context using a Frayer model. Project a copy of the Madam C.J. Walker worksheet using a document camera or projector. Explain to the students that today they will be learning a strategy that can help them understand what they read. Say, "Today we will figure out the meanings of some tricky words from a story. Good readers look for words that they don't know while they are reading. This helps us understand what we read better. Once we figure out what the words mean, we can re-read the story again!" Read the Madam C.J. Walker worksheet aloud. As you read, stop and circle each of the unknown vocabulary words. Explain to the students that finding out the unknown words will help you understand the main idea, or the most important point the author is trying to tell us about the story. Say, "The main idea is sometimes in the story as a sentence or phrase. But sometimes, it's not so clear, and we have to think about what the author wants us to learn from reading the story." Call on a few students to offer ideas about what they think the main idea of the story is, prior to learning what the unknown words mean. I don't know what these words mean. I heard the words in the story, but I'm not sure what they all mean. I can explain what these words mean and use them in a sentence. 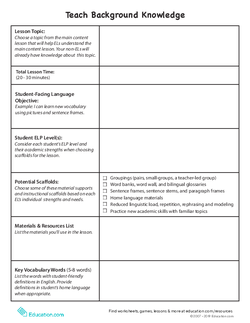 Use the students' ratings to form five small groups that are comprised of students with varying levels of comfort with the vocabulary words. Ask students to read through their vocabulary cards and definitions, using the visuals on the vocabulary cards for support. 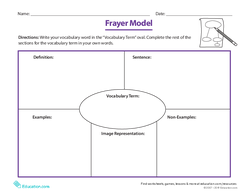 Assign each small group one of the vocabulary words and pass out a Frayer model worksheet to each group. 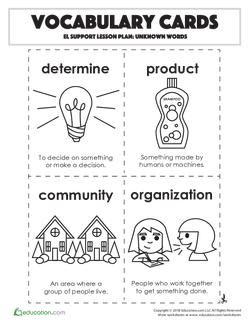 Explain the Frayer model to the class by using a common word to demonstrate the different parts of the model. Think out loud as you try to come up with examples, non-examples, and characteristics. Explain to the students that they can write words, sentences, or draw pictures to explain their vocabulary word. Give the students a few minutes to fill out their Frayer models. 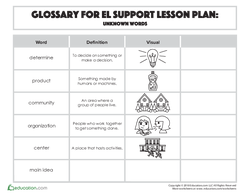 Have one student from each vocabulary card group form a new small group. Ask students to bring their vocabulary cards with them. Model completing the sentence frame orally, using the same common word you used to explain the Frayer model. My vocabulary word was ____ and it means ____. My vocabulary word ____ reminds me of ____. An example of ____ is ____. A non-example of ____ is ____. Ask students to find their group members from their original vocabulary card groups. 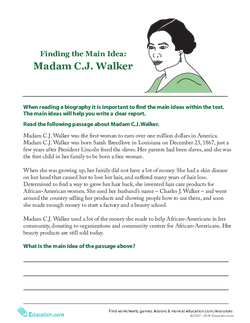 Pass out copies of the Madam C.J. Walker worksheet to each student. Have the students re-read the story with their peers, circling the vocabulary words in the story. Project the Madam C.J. Walker worksheet on the board using a document camera or projector. Circle the question at the bottom of the page. Explain that figuring out unknown words in a story should help us understand the main idea, or the most important information that the author is trying to tell us. Before learning the new words, I thought the main idea was ____. After learning the new words, I thought the main idea was ____. Have students do a think-pair-share, orally explaining the main idea to an elbow partner in their small group. Encourage a few students to share their answers, clarifying any confusion. Share with the students that you believe the main idea, what the author wanted us to learn, was that Madam C.J. Walker overcame many challenges to become very successful and help others. Reiterate that she is an important person to learn about! 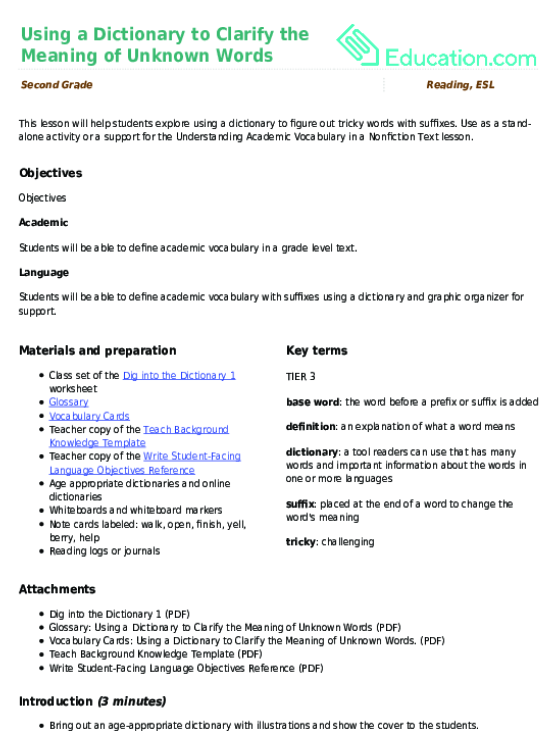 Provide definitions of vocabulary cards in English and student's L1. Group students with peers who mostly rated themselves as a 3. 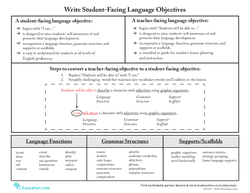 Allow students to refer to the completed Frayer model during the sentence level activity. Allow students to read text aloud to the teacher. Allow students to work with sympathetic non-EL partners during the formative assessment. Encourage students to create new sentences with their vocabulary cards. Challenge students to use one or two vocabulary cards during discourse activity. Challenge students to use two or more vocabulary words in the sentences they write. I still don't know what these words mean. I need more practice with these words. Prompt students to get out their journals or reading logs and ask them to write a sentence or two about the main idea of the text using a few of their new vocabulary words. Collect student journals/reading logs and use their answers to plan for future lessons on figuring out unknown words in text. Challenge a couple students to act out the meaning of one of the vocabulary words they learned! 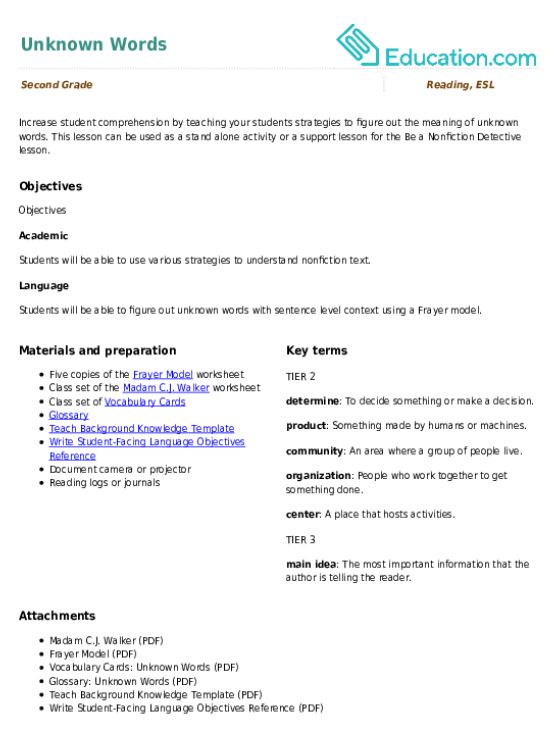 Explain to the students that they will continue to learn new strategies to better understand nonfiction texts, including the main idea, or the main point the author is trying to make. When reading, we all encounter unknown words at times. But how do we figure them out? 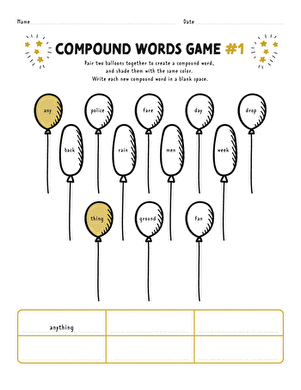 Give your second grader some valuable practice with compound words. Formed from the words on the balloons, she'll write new words in the blank spaces.